Today, June 14, is National Strawberry Shortcake Day! 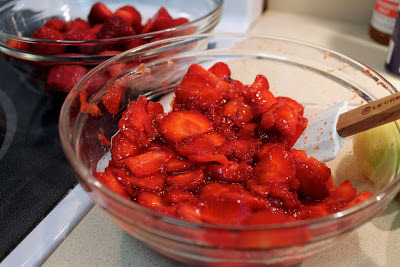 And there's no better way to conclude a late spring dinner when strawberries are at their seasonal best. This particular recipe is by New York Times food writer Melissa Clark, whose accompanying article debated the merits of classic dessert as made with a biscuit or spongecake. Clark's layer cake recipe leans toward the latter and it's absolutely delicious. I love how the lemon-pepper syrup adds additional notes of sour and spice, giving this better depth of flavor than just being sweet. 1. Heat oven to 350 F. Grease a 9-inch round cake pan with butter, line the bottom with parchment and grease the parchment. 2. 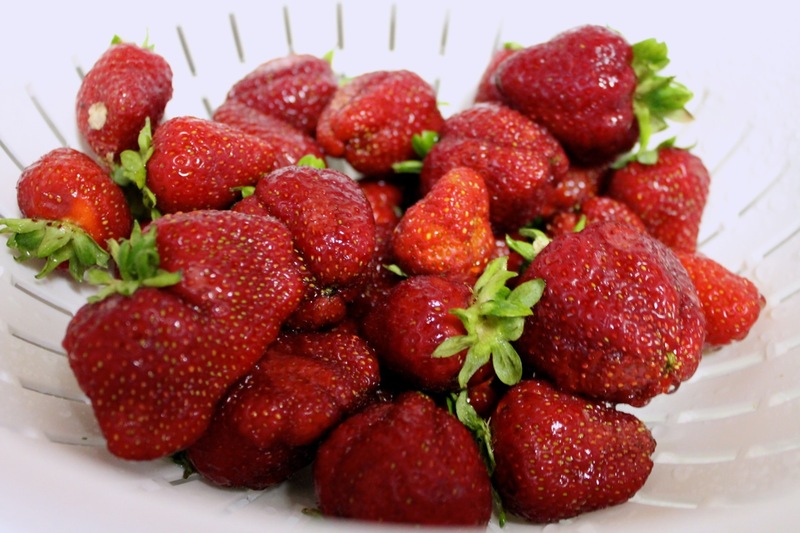 Cut off the tops of the strawberries and thinly slice half of them, leaving remaining berries whole. Mix sliced strawberries with the 2 tbsp. of sugar and half the lemon zest. Set aside. 3. In a small bowl, whisk together flour, baking powder and salt. In the bowl of an electric mixer fitted with the whisk attachment, whip eggs and egg white on high speed until frothy, about 30 seconds. Gradually pour in the 230 grams (1 1/4 cups) of granulated sugar and whip on high speed until the mixture is a pale yellow and has thickened enough to mound onto itself when beater is lifted, 1 to 3 minutes (note: in my experience, the mixture didn't really "mound," but after whipping it this long, it seemed fine once it was baked). 4. Using a rubber spatula, gently fold flour mixture into egg mixture. Fold in milk, 2 tsp. vanilla and 2 tbsp. melted butter until completely combined. 5. Gently pour batter into prepared pan and bake until golden brown and firm to the touch, about 30 to 35 minutes. Let cool 10 minutes in pan. Invert cake onto a cooling rack and peel off parchment. Let cool completely. 6. While the cake bakes, heat a medium saucepan over medium heat. Add remaining 1/2 cup sugar, 1/4 cup water and pepper and whisk together. Simmer until the sugar has dissolved and the mixture reduces by half, about 5 minutes. Remove from heat and stir in remaining lemon zest. (Note: don't do this step too far in advance as the mixture tends to easily recrystallize). 7. Whip heavy cream with 1 tsp. vanilla until soft peaks form. (Note: I considered making the whipped cream in my ISI cream whipper, but decided it might not have enough body to hold up the cake). 8. Using a serrated knife (like a bread knife), horizontally slice cake in half. Generously brush each cut side with lemon-pepper syrup. 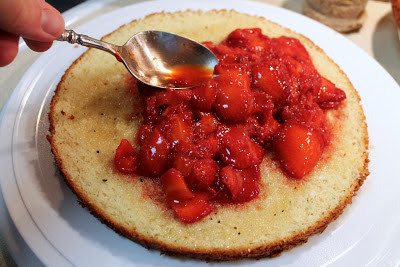 Transfer the bottom half to a cake plate, cut side up, and spoon sliced strawberries and any juices over it. 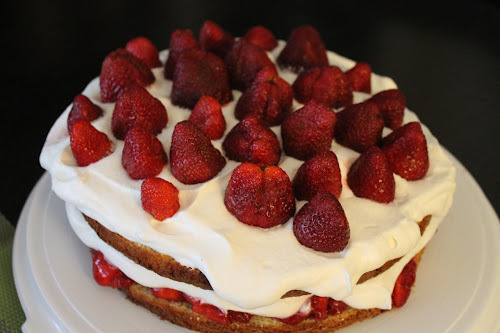 Spread half the whipped cream over sliced strawberries and gently place the other cake half on top. Spread remaining whipped cream over top and sides of cake (or mound it all on the top). Position whole berries all over the top of the whipped cream. The perfect end to the perfect summertime meal. Thanks for making this, honey.